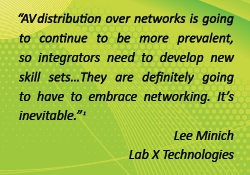 Designing today’s modern AV systems integrators realize that embracing the relationship with IT is crucial. As brought forward in an article by Biamp in 2011, AV Integrators are negotiating directly with IT staff at multiple levels from sales to installation. This is nothing new actually the collaboration of AV and IT has been in existence for quite sometime. 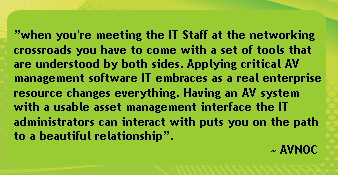 During the development of AVNOC Computers we took the AV/IT relationship in to consideration knowing full well that AV is a networked system involving IT departments every day. The unchanging fact both systems are connected illustrates that AV devices need to be in the loop of IP monitoring in order to make it a viable network device. Just like a switch or a server the ability to effectively monitor AV devices securely needs to become reality. Does the AV belong on the IT network? At first blush the answer seems to be a simple yes. However chances are if the AV is operating VTC systems a VLAN is being used for isolation. With that being the case or even a future consideration, the best way to tackle networking is to isolate the AV from IT. Savvy AV professionals know this already. Even if the AV is just being used as a local presentation IP networking should be the communication path and isolated in its own subnet. System management is immediately raised to an enterprise level once the AV is established in a network. Monitoring, Asset Management, Configuration Management, Remote Diagnostics and Managed Services also become a reality once an AV network is implemented. Being able to monitor AV for “up status” brings service to a whole new level as well. Some issues in applying network monitoring to AV are that the only real versatile products available are designed for IT professionals. Even the most talented AV Programmers seem to know little about server virtualization or deploying monitoring software within their own designs. Any IT monitoring product on the market worth it’s salt requires solid networking skills to provision and manage assets. It also usually requires setting up a virtual machine and that narrows the AV field quickly.